PALPA, JULY 31: Kali Gandaki Eye Care Center (KGECC), a community-based organization in Rampur of Palpa district, has provided free eye checkup and treatment to more than 5,000 people in fiscal year 2016/17. According to Sundar Rana, chief of KGECC, a total of 5,090 eye patients were benefited from the free health camps conducted at various places in the district. A total of 2,582 males and 1,690 females above 15 years of age benefited from the free health camps. Likewise, there were 428 boys and 390 girls below 15 years of age. KGECC Director Hut Raj Pokharel said that eye patients, especially those from the socially and economically backward communities, benefited from such camps organized with the aim of providing free, high-quality and appropriate eye care to all. Last year, KGECC conducted a diabetes screening camp where 45 diabetic patients received free health checkup. 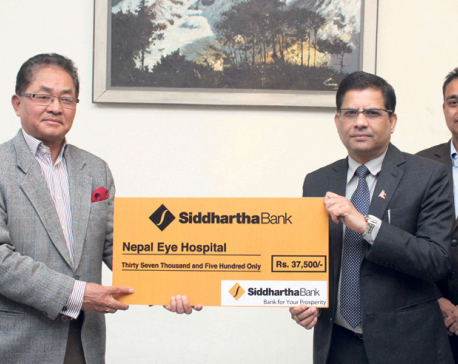 “The Centre provided free eye care and consultation and distributed glasses to patients on a daily basis,” said Sudip Gautam, an accountant at KGECC. In collaboration with Palpa Lions Lacoul Eye Hospital, Tansen and Lumbini Eye Institute of Bhairahawa, KGECC conducted cataract and eye tumor surgery. The Center has been providing free treatment to people by using the fund provided by the government.